In Indo-European languages, pronouns can distinguish up to three persons: first, second and third person, referring to a speaker, hearer and non-participant respectively. However, in other languages a fourth person emerges: the inclusive. It refers to both speaker and hearer. As such, whereas first, second and third person pronouns have a single referent as their obligatory or focal referent, the inclusive has two: speaker plus hearer. This dissertation investigates if other combinations of referents can make up the focal reference of pronouns. There are three such combinations: (i) speaker plus hearer, (ii) speaker plus non-participant, and (iii) hearer plus non-participant. Together with the atomic person referents (speaker, hearer, and non-participant), this yields a total of six possible persons. The dissertation argues that of these six, only four are ever lexicalised in pronominal paradigms. The only complex person is the inclusive, and other complex persons are unattested. Evidence is adduced from a wide variety of typologically diverse languages supporting this conclusion. This gap in personal pronoun paradigms is argued to be a part of a broader generalisation: the concept formation constraint. This constraint is rooted in the kite framework of Seuren & Jaspers (2012), an Aristotelian natural logic theory that maps the concepts of closed lexical fields and the logical relations that hold between them onto geometrical figures. 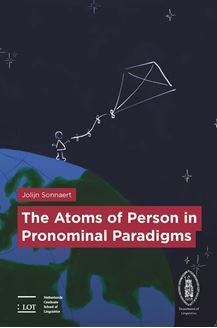 The author applies this framework to the lexical field of person, which explains exactly the observations made: only one out of the three logically possible complex persons can be referred to with personal pronouns: the inclusive.